Moroccan hair oil is a tried and true celebrity beauty secret. 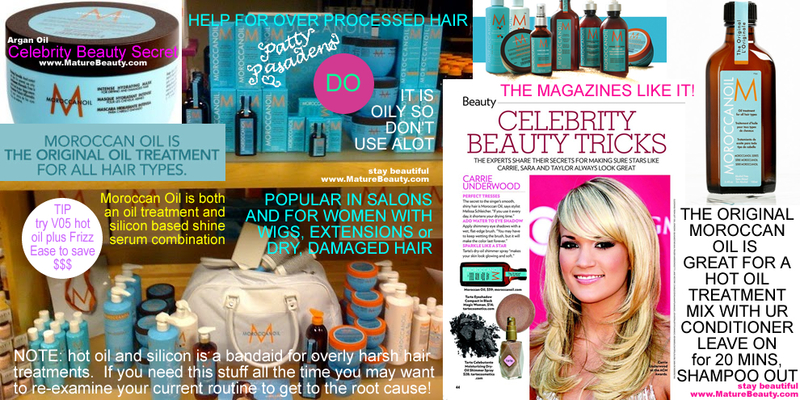 Hair care products from the company Moroccanoil receive celebrity raves in top magazines from Glamour to People, New Beauty, Self Magazine, Marie Claire, Lucky and Vogue. Moroccan oil products run upwards of $30.00 per hair product. Is Moroccan oil really good for your hair and skin? Moroccan hair oil gets fantastic reviews but I’m personally not a fan of using hair oils and silicones regularly. For the occasional spa-like home hair treatment however, I say go for it. I’ll also suggest cheaper alternatives for the budget conscious woman. If you require regular use of hair oil & silicone treatment products to make your hair soft and silky, you may want to step back and re-examine your whole hair care regimen. Finding the cause of problem hair and correcting it is more effective than buying products to conceal the damage (no matter how good they are). I love clean, fresh hair the best. A good hair shampoo and conditioner should be all a woman needs. Leave in hair products can often leave unwanted residue on the hair. That being said, sometimes the damage is done already, and that’s where hot oil treatments and silicone products can help make hair look healthier in the interim. Moroccan oil is another name for something called Argan oil. Argan oil is made from the kernels of the argan tree fruit. The fruit tree is native to Morocco. I’ll do another post on pure Argan oil in a separate review. Like many oils, Argan oil is super rich and while it can moisturize skin and hair it is, like many oils are, likely to make you break out from its greasiness. The Moroccan Oil product for hair that people have been raving about refers to a line of hair care products from a company called Moroccanoil that makes Moroccan Oil. It’s actually a hair care product that has Argan oil as one if it’s many ingredients. Moroccan Oil not only has Argan oil as an ingredient but it has many other ingredients commonly found in hair products. The product is made up of various silicones and you can liken it to a US product such as Frizz Ease by John Frieda. Moroccan oil is essentially a silicon based hair tamer with Argan oil in it. Women typically put a few drops of it on their ends before or after washing their hair for a softening effect. Moroccan oil is well reviewed by women who have extremely thick, coarse curls. They work a few drops of it into wet hair immediately after washing/towel drying or coloring it for a taming effect. Some women will sleep with a little in their hair for a deep conditioning effect. If you were to use too much of this product your hair is going to get way too oily. Only a few drops are needed and the Moroccan oil bottle I have to warn dispenses the fluid way too easily. You can easily glop too much out of the bottle. Maybe they’re hoping you’ll waste or spill some and need to buy a replacement sooner. Women with severely coarse or damaged from bleaching hair are the ones who review it positively. If your hair is naturally coarse, with split ends it can be a nightmare to achieve shine, softness and natural movement. Women plagued with this type of hair seemed to like using a teensy tiny amount on hair prior to it drying. If your hair is a frizzy mess you might like it. I’ve read hundreds of reviews on Moroccan oil as a remedy for thick, dry, and color treated hair and women do like it. It has positive reviews in general. Beware of allergic reactions to Moroccan Oil. The biggest complaint that I read about Moroccan oil had to do with elements of its ingredient list that are likened to poison chemicals, one chemical in it that gets slammed as a toxin is Coumadin. I’ve also read tales about the Argan oil being polluted by ahem, using already consumed pits and seeds to create the Argan oil from. Women who break out in a rash or zits from using the oil have sensitive skin and they claimed it massively irritated their skin at the hair line causing breakouts. The most appreciative of the Moroccan oil reviews comes from women who use hair wigs, hair extensions and hair pieces. Moroccan oil Intense Hydrating Mask and other Moroccan oil hair products are really popular among salon stylists for use on human hair wigs that they style in the salon. I’ve read in numerous reviews that it helps to add life to a dry dull wig and helps keep the wig in top condition. It’s popular for wig care. I’ve also read reviews from celebrities that use hair extensions. Even former adult star Jenna Jameson who regularly uses hair extensions gives this product raves. It really is popular for helping detangle and manage wigs and hair extensions. Many of the women who use this product have problematic hair. They have damage, wear extensions and are looking for something to make their hair look moisturized and silky. You can use Moroccan oil as a styling and finishing aid on wet or dry hair. Some women put a few drops on ends to soften them. The product is said to reduce drying time with the blowdryer. Applying a small amount to dry hair works as a silicone shine serum. The best use is probably as a hot oil treatment. You can mix the oil with conditioner and leave on your hair 20 minutes. Make sure to shampoo very thoroughly after to remove all the oil and avoid greasy hair caused by the oil. I’ve found that if you must resort to regular oil and silicone based products, you may want to reexamine your current color and processing treatments as well as your diet. Not eating enough essential fatty acids like avocadoes and dehydration or unhealthful diets can cause brittle hair. Make sure to get your vitamins and reconsider harsh hair treatments that may be causing breakage. Your overall health can manifest itself in your hair, skin and nails. So if you are having problems you may want to reexamine your daily routines. An occasional hot oil or deep conditioning treatment can be helpful, as long as you don’t need it on a regular basis. Hair that is clean, natural and fluffy is more youthful looking than processed hair that needs to be regularly weighed down by hot oil and silicone product. Every few months try a deep condition with Moroccan oil, or just a hot oil treatment or olive oil or another type of natural oil which you can get from Wal-Mart in the chemically treated hair section, a health food store or Whole Foods Market in the skin and hair care section. I always combine oil with a 2in1 shampoo and conditioner. Oils can smell bad so use a fruity strong aroma shampoo or conditioner to combat it. Oils are so strong that I recommend you shampoo hair once or twice immediately after the conditioning oil deep treatment since you don’t want oily tacky hair when it tries. Morrocan oil combines the silicon smoothing with the conditioning oil, but you are paying over thirty dollars (and some salons charge $45.00 for Moroccan oil) for a bottle that can be duped for a fraction of the cost. On the other hand, since you are only using a dime sized amount of the oil, it’s going to last you a really long time so the high cost of Moroccan oil is not such a deterrent since you only use a teensy little bit of it at a time. I still think you can get a similar effect with a dime a dozen silicone based hair gloss product and a basic hot oil or vitamin oil. Morroccan oil is not all 100% argan oil. It’s also a silicon based hair product. As far as I am concerned, silicon hair products are a dime a dozen and you can get them at the drugstore. If you wanted to add oil and can’t afford the pricier Moroccanoil or pure Argan oil, you could always take a drop of jojoba, carrot, vitamin e, or even olive or coconut oil and use a dab in conjunction with a silicon product for a similar effect. If you look at the Wal-Mart in the section for women who have chemically treated, relaxed or processed hair, there are always a plethora of silicon based hair smoothers and jars of natural oils from vitamin e to jojoba, carrot oil and more. I have a growing baby belly and was using bio oil and lotion together for months . I found a cheaper bottle of morocan argan oil at Walmart and after reading how great it’s supposed to be I decided to try it to stave off any stretch marks ( bio oil works great but is a bit pricey ) . The morocan argan oil smelled nice but when I applied it it felt wired and not moisturizing really. Then I started feeling itchy, something I had not had a problem with before. My whole stomach got all red and irritated and now a day and a shower later ( and once I used a wet paper towel afterwards to clean myself further) I am still so itchy I’m completely miserable! I’ve never been so allergic to something ! I don’t even get poison ivy. Something in this is bad. Great tip. No doubt Moroccan oil is popular among the celebs. In general any oil or lotion can contain an ingredient that is toxic to some. Before slathering any beauty product it is best to test patch a tiny area of skin to ensure it clears your skin well and causes no itchy or adverse reaction. You never know when a product contains an ingrediant you are specifically allergic to. Smart to remove product as quick as possible, perhaps anti-itch cream would help in this circumstance and discontinued use. Thanks for commenting.